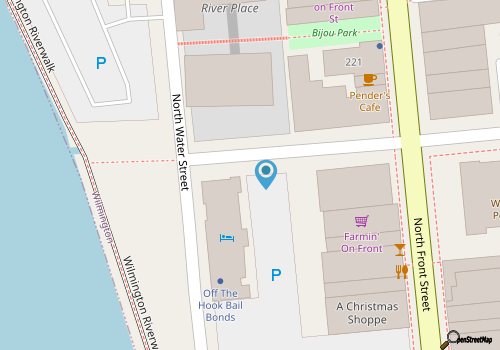 Adjacent to the waterfront, on aptly named Water Street, the park takes up 250' ft. of Cape Fear Riverfront, and borders the outskirts of the busy downtown, including a wide range of shops and restaurants, as well as the distinguished and historic federal courthouse. At the park, visitors will find a series of benches, a fountain, restrooms, and pristine landscaping which ranges from well-placed shrubs and hedges to pedestal plants along the borders of sitting areas. Picnic tables are on site for a breezy and effortless lunch, as well parking areas adjacent to the waterfront for easy exploring. The most distinctive region of the park is arguably the small grassy areas, which are strategically placed along the brick walkways and wooden Riverwalk. A slightly sunken garden in the center of the park features seasonal blooms and small evergreen trees, several benches around the perimeter, and a centerpiece art installation which changes every couple of years or so. The park is perhaps best known for the Riverwalk, the wooden boardwalk which extends for nearly a mile along the waterfront, as well as its bounty of seasonal events.At Riverfront Park, summer visitors will find the streets lined with Farmers Market vendors in the summertime, crowded with live music and delicious feasts during the annual Riverfest or Seafood Festival, and lit up with holiday cheer during the annual Downtown Christmas Tree Lighting at the end of November. Virtually every weekend brings a new reason to celebrate, and live musicians and artists frequent the area at random to bring an added dose of charm to the area. As inviting as Riverfront Park already is, plans are in the works to make it even more inviting for Wilmington residents and visitors, with the initial planning stages of an overhaul in the works. The park has remained relatively unchanged since it was built in the 1980s to attract more tourism and business to Downtown Wilmington, and tentative strategies are in place to add a new water feature, some new vegetation and trees, and maybe even some additional "green space," or natural landscaping by the water. In the meantime, visitors are welcome to stroll the wide wooden Riverwalk, relax in the shaded waterfront pavilion, or simply settle into one of the many park benches to watch the town of Wilmington pass by. With ample areas to explore, and panoramic Cape Fear views at every turn, Riverfront Park is easily one of the most scenic locales along Downtown Wilmington.